Our style of Karate is one of the oldest styles of martial arts in the world. Okinawan Karate dates to the sixth century when Bodhidharma’s (Daruma), traveled from India to China where he settled at a Shao-lin (Shorin in Japanese) Monastery. The introduction of ch-uan-fa (“fist way”) occurred in the late 1300’s with the expansion of trade and cultural exchanges between Okinawa and China. Evidence suggests that te (“hand”), in fact, was an indigenous martial art to Okinawa, (the birthplace of Karate), developing in the villages of Shuri, Naha and Tomari. Thus begins the lineage of Shorin-Ryu Kobayashi Karate from the Shuri-te system. 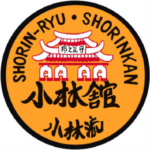 There are currently four major branches of Shorin-Ryu Karate practiced in the world today, Kobayashi-Ryu, Shobyashi-Ryu, Matsubyashi Ryu and Matsumura Seito. In the Shorinkan we practice Kobayashi Shorin-Ryu. The Shorinkan is headed by Hanshi Shugoro Nakazato Sensei, a man who is literally considered an intangible cultural asset of Karate by the Japanese government. The patch itself is circular, just like most traditional karate patches, to represent the full circle of martial arts training from student to teacher and back to student again, everything in Karate from techniques to principles, always moves in a circle. Originally new students were given red belts not white belts and masters simply returned to the red belt representing that they had traveled full circle. The Japanese writing on the patch is called Kanji, the small writing on the bottom reads “Shorin-Ryu” which means “Small Pine Style” and the larger writing above it reads “Shorinkan” which means “Small Pine House.” Karate had its influences from Chinese Kung Fu, Japanese Jujitsu and the original Okinawa art of Te.